I think I’ve mentioned before that we had an incredible September weatherwise here in Cornwall and with the summer tourist season over and most children back in school, the beaches were deserted. This entry was posted on October 25, 2014 by Chillbrook. It was filed under Cornwall, Photography and was tagged with Adrian Theze, Beach, Chapel Porth, Cornwall, Cornwall Photographic, Cornwall Photography, Landscape, Landscape Photography, photographs of Cornwall, Photography, Sea, Seascape, Seaside. Their gestures are perfection, against the expanse, it’s lovely. Wonderful soft light, and the splash of bright colour to lead or eyes in….nice one! Thank you Sue. After such a dull day, I felt like posting a bit of feel good late summer sunshine! Wonderful photo. I love the space and tranquility. How lovely to capture such a moment ChillB … such freedom and innocence of childhood that your image evokes is to be cherished . Lynn describes it perfectly . Simply beautify and having te 2 girls there provides an incredible perspective. A beach to themselves. Everyone’s dream. Lovely photo. Thank you very much Gunta. I usually avoid people in my landscape shots but on this occasion, as you say, they create a narrative and make the picture. I really like the feeling of freedom and potential in this image; partly down to the inherent space but also the colour combination. How marvelous for this family. You’ve captured their unbridled glee. I want to be there too! Thank you again Joshi. 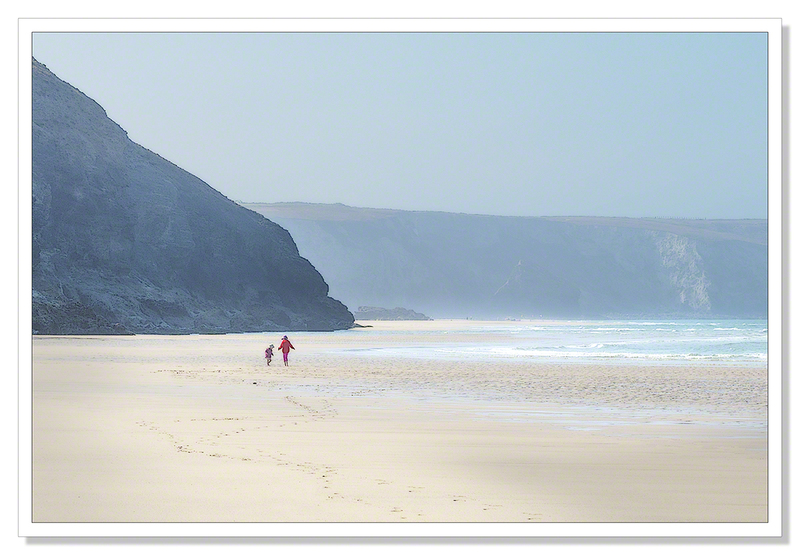 When the tide is low at Chapel Porth, several smaller beaches become one huge beach and you can walk for miles.. tide permitting of course. Wishing I was on that beach too, Adrian! It looks idyllic.